Real critique has become a lost skill among collaborative teams today. Critique is intended to help teams strengthen their designs, products, and services, rather than be used to assert authority or push agendas under the guise of "feedback." 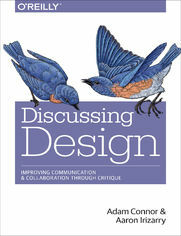 In this practical guide, authors Adam Connor and Aaron Irizarry teach you techniques, tools, and a framework for helping members of your design team give and receive critique. Using firsthand stories and lessons from prominent figures in the design community, this book examines the good, the bad, and the ugly of feedback. You’ll come away with tips, actionable insights, activities, and a cheat sheet for practicing critique as a part of your collaborative process. How Often Should You Critique?